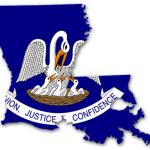 The National Council on Compensation Insurance (NCCI) presented the details of its proposed +0.4 percent loss cost increase for the state of Louisiana at its annual State Advisory Forum in Baton Rouge yesterday. Local leaders in the workers’ comp space were generally pleased with the move after years of significant rate decreases. If approved by the Department of Insurance, the change will take effect on May 1st, 2018. “It is good to see a recognition of medical and overall claim severity and not just frequency driving ratemaking,” said Troy Prevot, Executive Vice President of LCTA Workers’ Comp. Frequency was the oft-cited reason for previous years’ decreases, including last year’s relatively steep -9.8 percent decrease. Prevot added that, given the shift, he would have liked more state-specific talk during the presentation, as opposed to the information about the health of the national system. 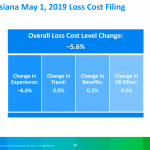 NCCI actuary Nadege Bernard-Ahrendts gave the breakdown on the loss cost increase, which is attributed to four components of the overall Louisiana workers’ comp system: declining premium volume, deteriorating combined ratios, declining frequency, and increasing indemnity and medical costs. Total Louisiana direct written premium for workers’ comp decreased from $869 million in 2015 to $814 million in 2016. Meanwhile, lost time claim frequency has dropped 49 percent from 2001-2015, but average medical claim severity has increased 114 percent during that same time period. 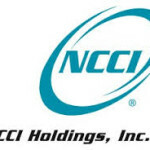 Louisiana is one of just three NCCI states (37 in total, plus D.C.) for which an increase was filed for 2018. The other two were Virginia with a +1.1 percent pending filing and South Carolina with a +2.5 percent approved increase. Yesterday’s presentation also included a discussion of the general economics in Louisiana (payroll growth, private employment, and average weekly wages are below the national average here) and a closer look at the legalization of medical marijuana as it relates to workers’ comp payers.